Can Infinite Universes Explain Fine-Tuning? Have We Lost the Christian Mind? Would Torture be Good if God is Evil? The day before the first Christmas was a normal day; it was just like any other. People awoke and began their chores. There were fish to catch, meals to prepare, fields to tend, shops to open. Oh, sure the cities were a bit busier than usual, what with the census causing many people to travel, but that just meant the opportunity for more business in the merchants' eyes. Everyone else was inconvenienced by the crowded roadways and the disruption of schedules. Traffic makes it difficult for locals to finish their responsibilities. But such was part of life in this part of the world. So, people went about their day not thinking twice about what kind of a day it was. The herdsmen took their flocks to the pastures outside of town to find them food. An old prophet and prophetess sat at the temple in Jerusalem, each praying as part of their daily routine, one that they duplicated for so long they had lost count. They pray that they might catch a glimpse of the power of God to rescue their people. But they don't mark this day as anything more. It's simply one more opportunity to petition the Almighty. There were the common complaints about politics. Some complained that the government taxed too much, others that we should submit to the status quo. Those that sought to overthrow the power structures were seen as zealots, but even they saw today as another day in their quest for autonomy, claiming God was on their side. Herod was sitting fat on his throne, probably feeling fairly content. His partnership with Rome had brought him considerable power and success. He felt he had the power to vanquish any threat to his rule and his building and construction projects had made him famous. This day he felt no particular worry about losing his title as King of the Jews. Everyone across the world didn't note this day as anything more than another day. They did not have the luxury of history that we have today. They didn't know that tomorrow would bring the birth of one child and the beginning of end of their world. They didn't realize that one infant arriving in a small backwoods town would be an event so enormous that all of mankind would reckon time by it. Those shepherds didn't know that tomorrow heaven would be so filled with joy that they would see it burst at the seams and hear glorious praise spill onto the earth. 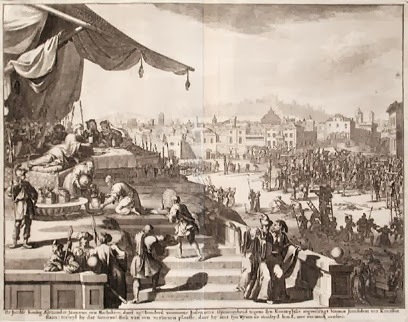 Herod didn't know that he would soon be dead and in less than a century his glorious Temple project would be wiped clean from the mount as well as the Jewish worship rituals it supported. Simeon and Anna didn't know that they would have their prayers answered in just a few days, cradling in their arms the Messiah of the Lord. Even Caesar Augustus didn't know that this child would turn Rome inside out. That first Christmas Eve was remarkable because it was utterly unremarkable. Today we remember His coming and tomorrow we celebrate with friends and family. But come January 30 or March 22 or September 16 we will be back to experiencing ordinary days. I pray that as we think about the birth of the Savior of the world, we would reflect on God's promise and His deliverance not only on December 24, but on those ordinary days, too. Be like that old prophet or prophetess. Make worship and expectation that God is working part of your daily routine. Because you never know, God may make tomorrow earth-shattering.